Manufactured in Japon from 1985 until 0. 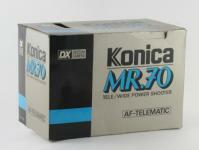 The Konica MR.70 was one of three twin-lens cameras showed at the Salon de la Photo in Paris in 1985. The two other cameras were the Minolta AFT and the Fuji TW300. Here, the twin-lenses are obtained by a retraction of a part of the optical system. The short lens is a 38mm. The lens is then made of 4 elements divided into 3 groups. It then opens at 3.2 (up to f/16). The long lens is a 70mm. The lens is made of 8 elements in 6 groups. The aperture opens at 5.6 up to 24. The small lever located at the base of the lens, reported by two small symbols and two letters "T" and "W" (Tele and Wide) can move from a lens to another one. An accessory lens mounted on a swinging arm has to position itself at the rear of the wide-angle or on contrary to retract. The viewfinder simultaneously adapt to the change of lens length. This viewfinder is with framelines. The focus is automatic, thanks to an infrared autofocus. The focus is made through 13 steps, between 1.20m and infinity. 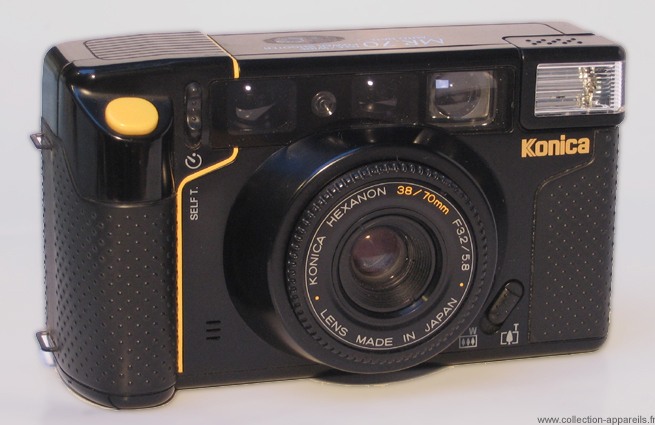 The autofocus is triggered by pressures on the shutter release. The setting is stored as the pressure is not released, which makes it possible to throw off centre the main subject from the photo. The exposure metering is provided by a CdS cell. The informations are transmitted to a shutter / aperture. The shutter speed information is privileged in the method of calculation to reduce the risk of motion blur. If exposure is considered correct, a green LED lights in the viewfinder when the pressure on the shutter release. If the LED stays in orange, then we must use the flash. The coupling with the short lens allows go from 1/25 at f/32 to 1/250 at f/16. With the small telephoto, it goes from 1/25 at f / 5.8 up to 1/230 at f/24. The flash is activated by a button located near the frame counter. When it is activated, the LED of the viewfinder turns green. The recycle time of the flash takes 8 seconds. The Number Guide is 12. The flash allows the fill-in by the coupling of the flash with the exposure metering. The finish is very good, the handling and ergonomics are very good. This copy has a data timer, which originally was not available in France.